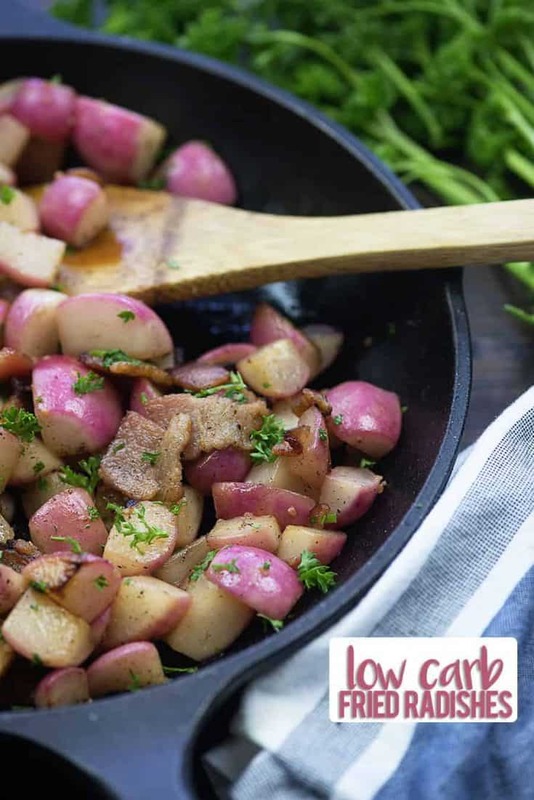 If you’re following the keto diet and miss potatoes, you have to try these sauteed radishes! They’re the perfect substitute and make a great side dish at breakfast or dinner. My husband is a huge breakfast guy. He loves when weekends, because I almost always cook him a big breakfast. Fried potatoes – not anymore. You guys, he was missing the fried breakfast potatoes, I’m not going to lie. I was too, if we’re being totally honest. What can I use instead of potatoes? No. There are no low carb potatoes. Potatoes are just basically one big ball o’ carbohydrate. Then I stumbled upon radishes. Y’all. Just you wait. These are going to knock your socks off. Now, look. These ARE radishes. There’s no denying it. Buttttt, they don’t taste anything like a raw radish. Just like cauliflower potato salad is actually cauliflower, but it doesn’t make it any less delicious. 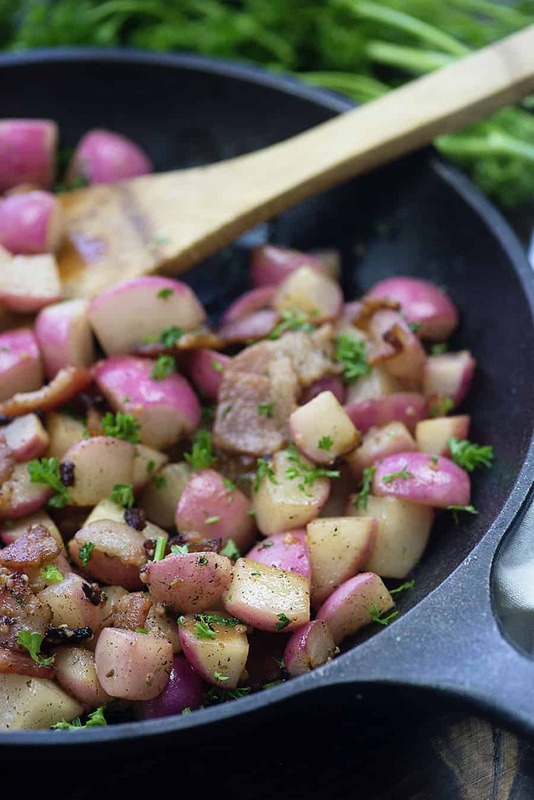 Radishes for potatoes are an amazing swap. The radishes soften up like a potato and loses most of it’s bite. 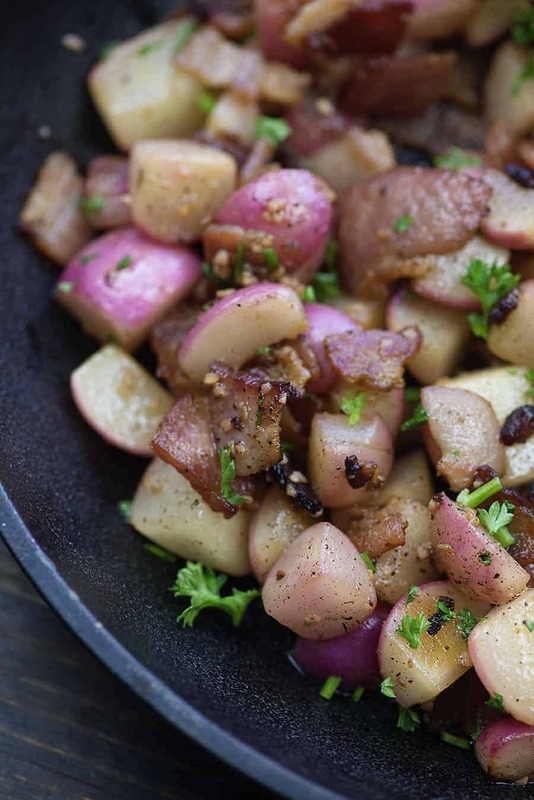 Fried radishes, especially ones fried in bacon grease, are just close enough to potatoes that you’ll think you’re dreaming. Radishes fried in butter are pretty darn tasty too! How can something that softens up, looks like a potato, and gets all starchy tasting be low in carbs? Based on my research, one cup of sliced radishes has just 3.9 carbs and 1.9 grams of fiber. This means that an entire cup is clocking in at only 2 net carbs! One pound of radishes has 20 carbs and 10 grams of fiber. You’re probably going to have enough room in your carb allowance to eat radishes every day at those numbers! This is the easy part, my friends. I like to dice them up. Just cut them into quarters for that fried potato feel. 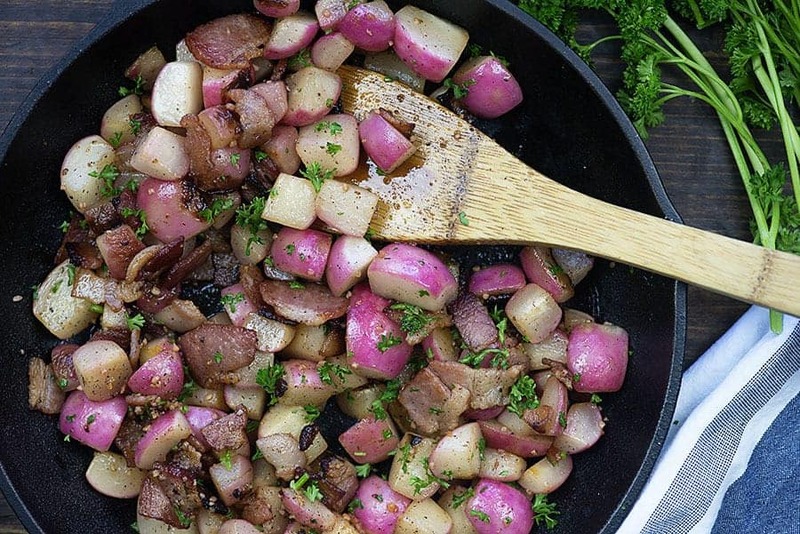 In this recipe, we’re frying up some bacon and then adding in the diced radishes. The radishes take about 15 minutes to soften. 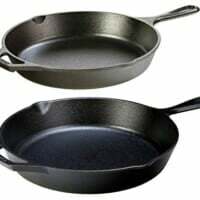 You can cook them longer or shorter, depending on the texture you’re going for. I added garlic, parsley, salt, and pepper. I wanted to keep the seasonings simple for this one and they came out perfectly. You can add whatever flavors you like, though! 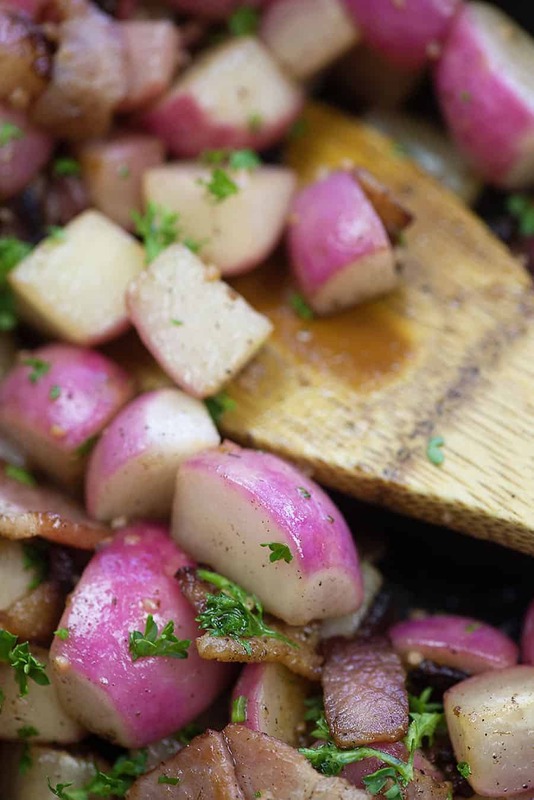 I think these fried radishes are going to be a total hit in your household. Heat a large skillet over medium heat and add the bacon to the pan. Cook, stirring often, until nearly crisp. Add the radishes to the pan with the bacon and continue cooking, stirring often, until radishes are softened, about 15 minutes. Sprinkle with salt, pepper, and parsley before serving. OK, I”ve always hated radishes, but I want potatoes so bad. I’m trying it on your recommendation, Karly! So far you haven’t led me astray so fingers crossed. This looks great. Will try this weekend. Wonder if you could add a small amount of onion and saute that up for a hash brown with onion? Tried this today was absolutely yum. Will have often. I would never have thought to cook radishes. Hubby doesn’t like them raw but loved them cooked. Thanks for the recipe. Hi, Karly! I’m wondering if this would freeze? Would love to make up a double batch and freeze half. I’m not sure – I’ve never tried freezing cooked radishes before. Thank you. I just put out my pork loin and cant wait to fry up these radishes tonight. I can’t wait to try these tomorrow. I will be an avid follower and fan. I was so upset because I have so much weight to lose. Now, I don’t care how long it takes, because it’s such a delicious journey! I don’t miss a thing! I just found this page the other day and decided to try this. I would have never thought to try radishes in this way, and it was delicious! I added onion to it and it is a fabulous replacement for fried potatoes. Hmmm. Sounds delicious! Has anyone tried to fry these like French fries or cut up in strips and air fried? Never liked radishes, but they were half price at Aldi, so thought, as I hadn’t had them for years, I’d give them another try. Thank you so much for recommending to cook them, I’d never have thought of that! I did them with bacon, mushrooms and a knob of butter in my air fryer and they were so lovely with fried eggs and halloumi. Based on all the nice people’s comments and Melanie’s tasty photos, I’m gonna give it a go. My wife dislikes radishes so it’s a little risky, but not too risky because radishes aren’t gonna break the bank. 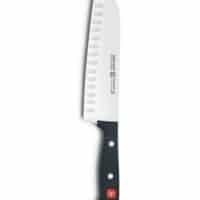 Looking to add another quality low carb vegetable to our list! I am SO excited to try this, I just happen to have radishes in my fridge! I do have one question: do you drain the bacon grease before adding the radishes or just leave it as a sort of sauce? All I can say is , thank you, thank you and thank you. 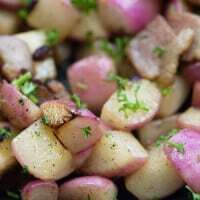 I could not believe how good fried radishes are and they do substitute well for fried red potatoes. Just had some with with an egg sunny side up. Delish.